The prophet here can be identified by the name 'AARON' inscribed on his scroll.. Aaron was the brother of the Old Testament patriarch and prophet Moses. Aaron often accompanies his brother in Jesse Tree images. Jesse Trees with their kings and prophets were produced in all forms of church art from the 11th century and throughout the medieval period. There was no standard convention for the depiction of the prophets and the kings. The style of painting on this figure is the same as on those in panels 5D-E and 6A-B-1881. The facial features are full and rounded. The eyebrows are heavy and the eyes and pupils of the eyes are large. The clothing follows the form of the body. The figures' hair is straight and not curled. These figures are identified by their inscribed scrolls, have a large stemmed flower within the demi-quatrefoil they stand in and there are no small sections of ground between their feet. All of these feaures distinguish this group of prophets from the other group (5 to 5C-1881). The whole figure in this panel is the reverse of that in no. 5E-1881 indicating that they were made from the same cartoon or design drawing. AARON bordered top and bottom. The figure is placed within a half quatrefoil. His left foot rests on top of the edge of the border of the quatrefoil and his right foot is placed on the lower inner border of the quatrefoil. There are floral sprays of blue, yellow and clear glass in the upper and lower spandrels of the quatrefoil. On the right of the panel is a vertical border of floral sprays composed of clear, green and brown glass. This border floral pattern is broken in the middle where it is dissected by the right projection of the quatrefoil. From the same cartoon as 5E-1881. 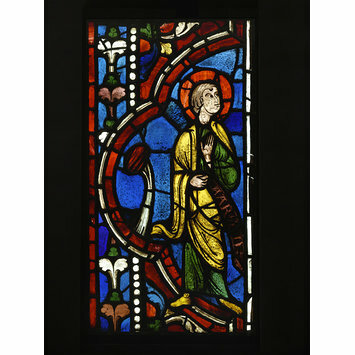 Panel of clear, coloured and flashed glass with painted details. 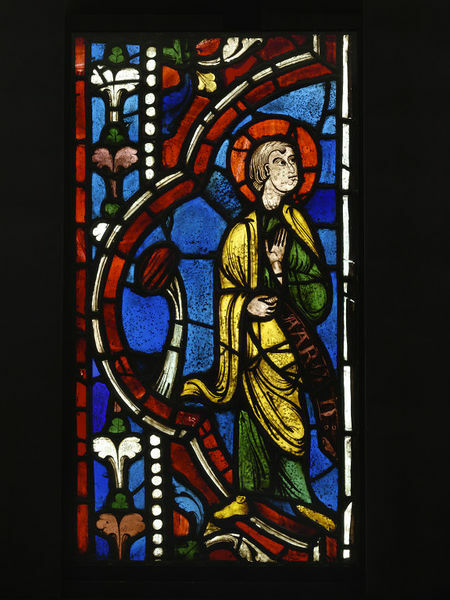 Depicting the prophet Aaron from a Tree of Jesse window. Probably from Troyes Cathedral. 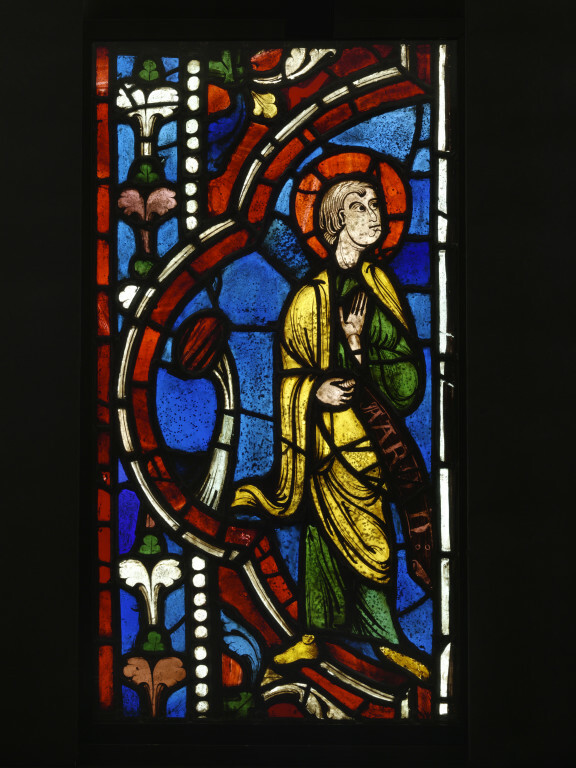 Made in France (Champagne), c.1210-45.